There was a clunking noise above my head, followed by a grunt and a smash. A long dragging noise vibrated through the floor. I peeked up the stair well, trying to figure out what the latest argument was in what had become a two month long string of brawls. The bickering began innocently enough disguised as sibling rivalry. A "his stuff is on my side" here / "why are you breathing like a freak" there, but had evolved into what can only be described as...unmanageable. As mothers of tween boys know, there is something odd that begins to happen to our darling fellas right around their 11th birthday. All of a sudden you begin seeing these passionate/violent explosions that come out of nowhere. Unprovoked rage that's looking for a wall - or face - to punch. And when you've got two brothers so close in age that they're going through it together? Then you're right back to where we were, with Camden attempting to drag his mattress through the hall and down the stairs because he'd "rather live outside on the patio than take one more millisecond with THAT JERK." 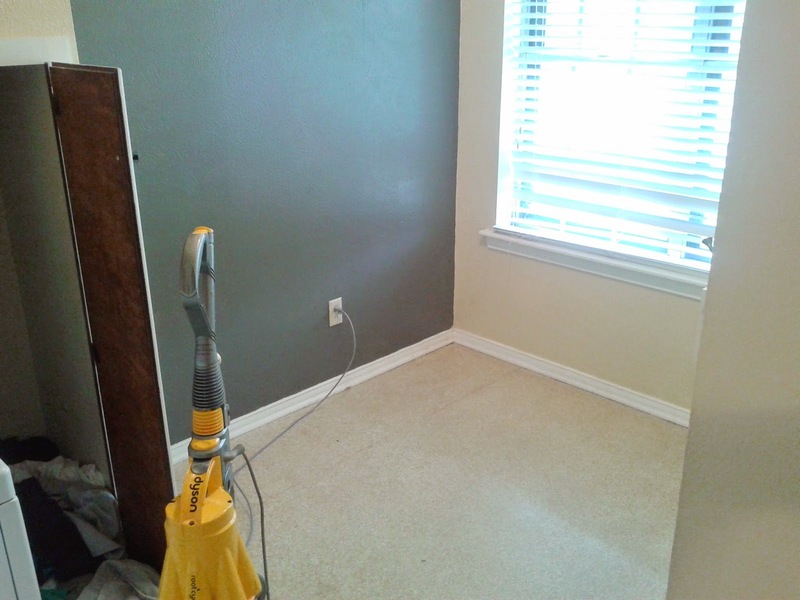 When we moved into this house, the 3 youngest boys shared the bigger upstairs bedroom. Hayden was eventually evicted and moved downstairs with Brendan as his favorite hobby had become annoying the two older ones. But now - AS MUCH AS I BELIEVE CHILDREN SHOULD SHARE A ROOM - we needed to get creative. Without moving. Or spending any money. That row of hooks was perfect for backpacks of yesteryear that weren't carrying overstuffed middle school binders and 20 pounds of high school textbooks. Adolescent bags are much too heavy to be hung up now (no matter what pinterest tells you), and those hooks had sat empty for years. Speaking of empty, although the left side of our laundry room is taken up with the washer and dryer, the other side was just doing nothing. Sure, it housed the perfectly organized heaps o' dirty clothes like a boss, but that's technically what that laundry shoot is for. All that other stuff? Procrastination mixed with pure, unadulterated laziness. There were grand visions of turning the whole space into a super efficient storage mecca, but I suppose that will just have to wait for another season of life. Never doubt the sacrifices a mother will make when she's desperate for some freakin' family harmony. 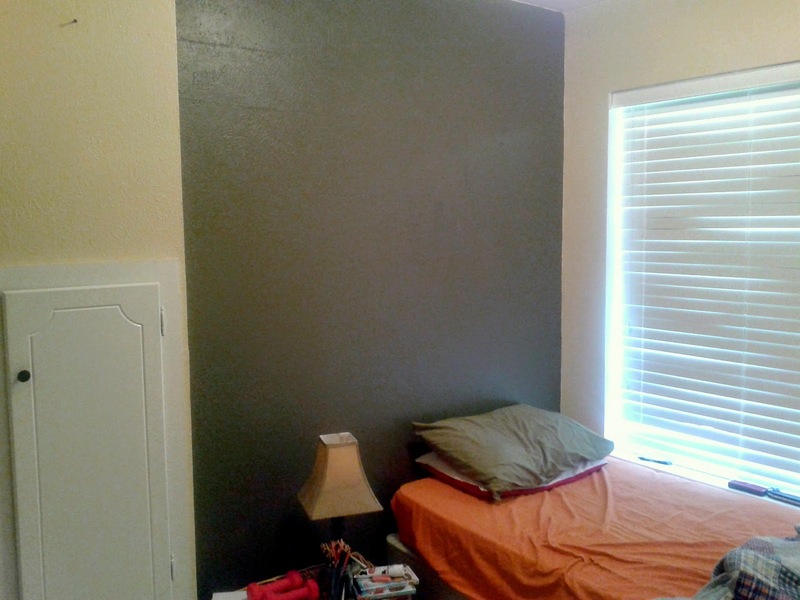 A quick coat of dark charcoal paint leftover from the boys' dresser upstairs got put onto that recessed wall. We moved in an old area rug to warm up part of the 1968 (complete with embed glitter!) linoleum. The temporary trash nightstand and lamp moved in that first night until we sorted who got what from the custody battle of stuff upstairs. The tv that's used for video games got plopped onto a shelving rack from the garage. I was having panic attacks at the thought of Camden telling his future therapist about his Harry Potterish set-up...but instead? 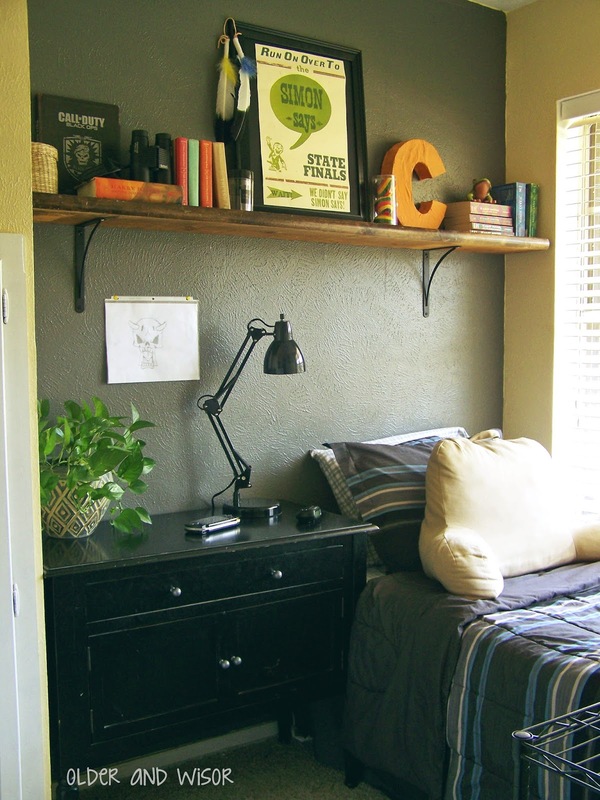 It became the "cool dorm room" that everyone wanted to hang out in. 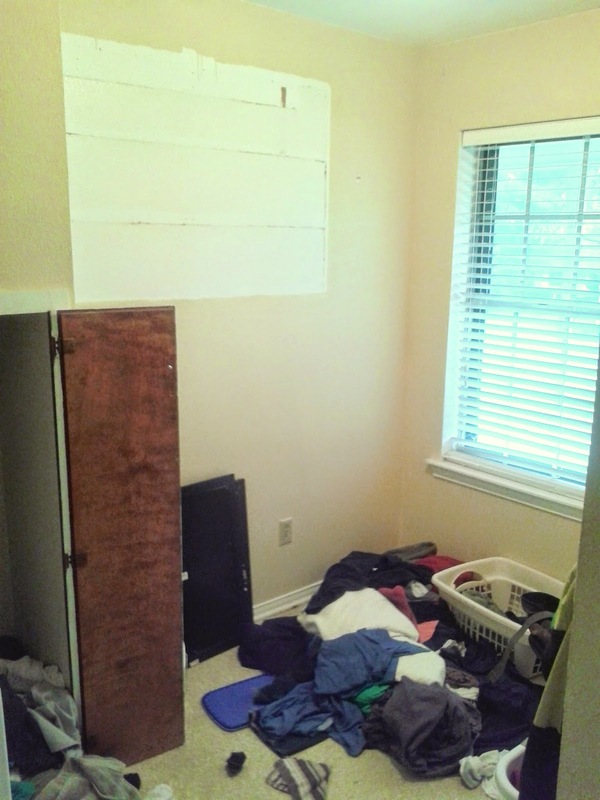 He kept all of his clothes stored where they were upstairs, but he wanted a little storage/display space to make it feel less hobo-with-a-mattress-in-a-laundry-room. 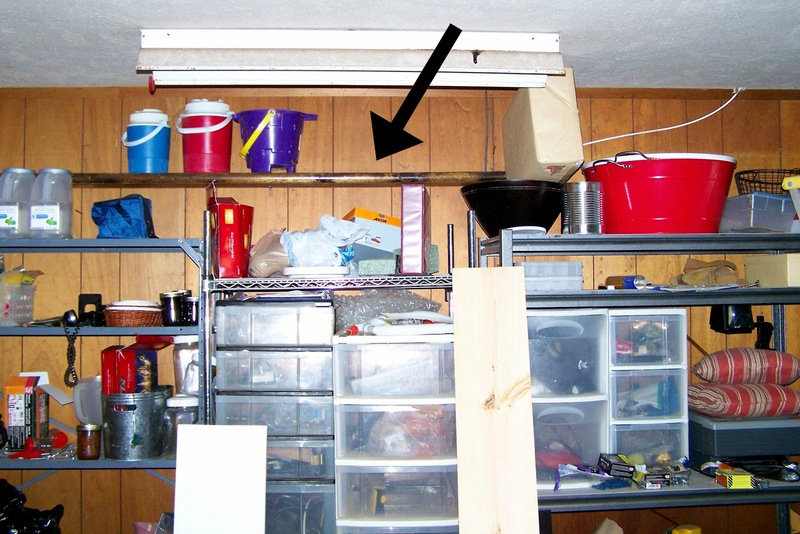 That tall shelf in our Very Organized Garage wasn't holding much but some old thermos (thermoses? thermosi? ), and was chunky and wood and once it got a few inches cut off the end, fit perfectly. Instead of wasted space, we now have a reason to keep the laundry from getting backed up AND harmony in the house. Here's to working with what you've got. This is SIC!!!! I had to scroll back several times to make sure it was the same "room"! you are amazing! Your best redo to date! My daughter is moving back home and her two sisters said "she is NOT coming back in HERE!" (they were giddy when she left!) So I am trying to figure out where to put her! thanks for the inspiration!!!! It's a good thing he *doesn't* want to go back upstairs - the brother up there has enjoyed having his own space just as much. I don't blame your girls one bit! Good luck, Mama!! I love to use every inch of space in a house. This is awesome. Believe me ,not an inch is untouched at my house. That is INCREDIBLE. Good solution for new private space for the kids, no cost to parents, and awesome remake. You rock, Ms. Rebecca! Sometimes it's a good solution because it's really the ONLY solution, eh? Desperation breeds creativity. I think his future therapist will think you were brilliant for preventing Camden from attempted murder! ha! ha! You're a creative one, I tell ya! That would be SOOOO much to clean up...spiders...spilled dog food...and the scariest thought of all: all my crap. I hope you have help to spiff it up! I can't imagine it's a free solution, but it's definitely a good one! I'd love to see before and after photos!! Necessity is the mother of invention! 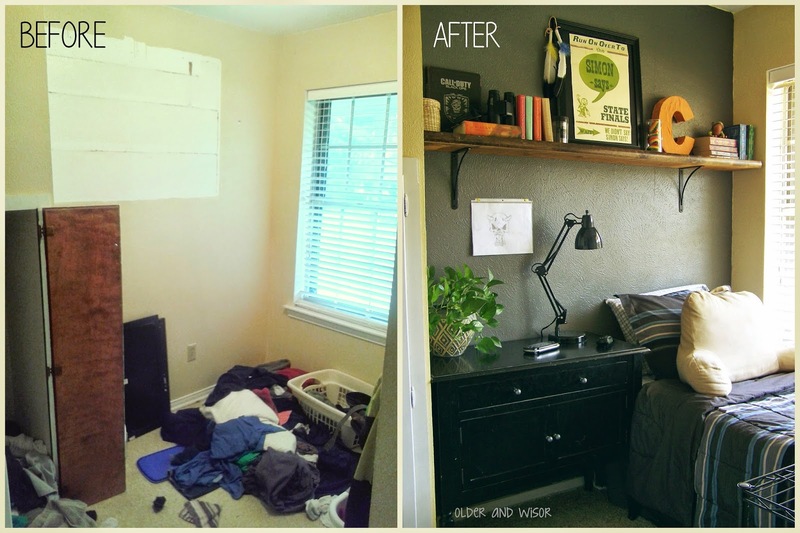 Who would've thought to make a bedroom in the laundry? Genius! And it looks awesome. Here's to tranquility, or at least, less fights. "I'm a donkey on the edge". That's who. Tranquility is for the dead, but the less fights part? Success. What a great looking laundry room bedroom. 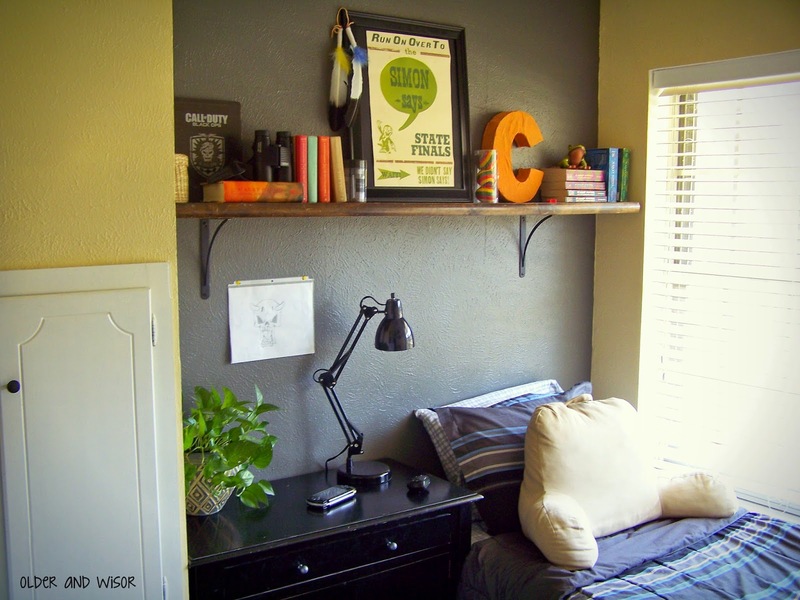 How perfect that the alcove fit a twin size bed. Another awesome redo by you. Cudos! It was Divine Intervention to be sure! me again. the one with the returning child. Do you think i could use wrapping paper to cover some windows in our "back room' ? I think she's gonna end up in there. Do you mean to make them look better or to keep the light out? Both, really. And I already did it! The "room" turned out pretty good!! I want to send you a picture! I may just move in there myself! You really inspired me to get creative! thanks mucho!!! Absolutely - I LOVE pictures!! What a great little room you created out of nothing! Glad they're back to being friends too. 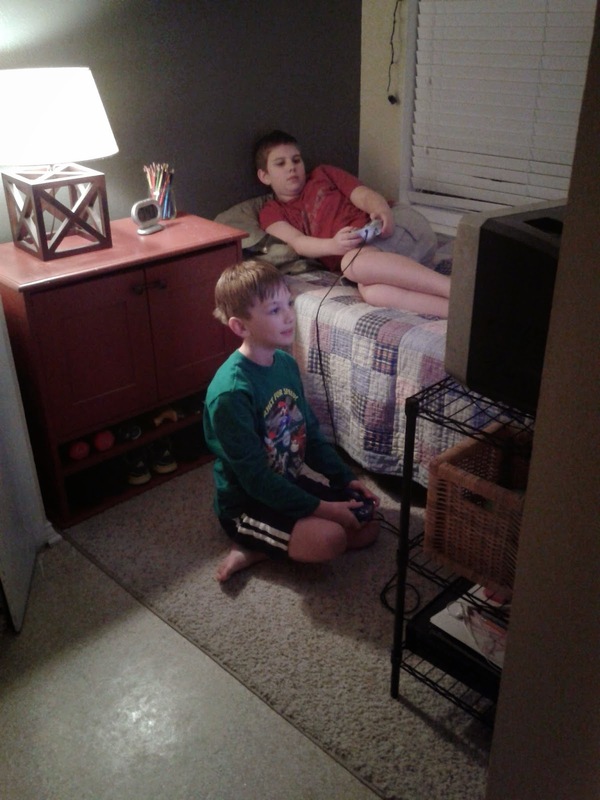 I only have 2 kids, a girl 24 and a boy 22, they had their moments where the hormones and tempers flared, but luckily the each had their own rooms. And luckily also, they are and have mostly always been the best of friends. So glad you shared this make over with us. Maybe that's the trick - just one boy? I had one brother and don't remember there being much fighting, but as I had three sisters, he was probably too busy staying out of the drama created by us four older girls. My poor mother. Wow it looks awesome! I never got to share a room with my sister (we are 8 years apart) but I always thought it would be fun for a season. The new room looks lovely !